'The Locket' is adapted from the 'girl' who first came alive in my book, 'The Truth, I'm a Girl, I'm Smart and I Know Everything'. 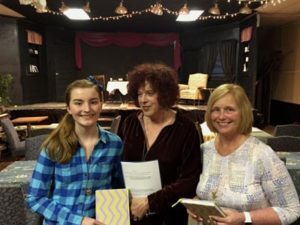 The play brings to life an extra dimension, involved with the magic of the adult who was the girl, being able to communicate with herself as a child. 'The Locket' is a magical, complex one act play in which a woman frustrated and hurt by a serious argument with her husband, is led back to her own strength and coping skills by discovering her childhood diary and the locket, with her own messages of courage, hidden inside of it. Magic happens when the girl, her own self from childhood appears to share wisdom, sorrows and advice with her. They are also visited by an Enchanted Person and an character, know as Self, to further assist them in understanding how to recover from emotional wounds and disappointments. Bits of magic and psychological wisdom happen throughout. Anyone of any age, who has had a fight with a family member, or is old enough to know that family life is not simple, nor is falling in love, will enjoy this play. 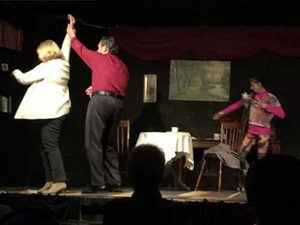 The play has had three page to stage readings, including one at the Dramatist Guild in Manhattan and one full production in Howell, New Jersey at the Grange Playhouse. How Did The Magic For 'The Locket' Begin?